Kelli and I headed down to the lower Rio Grande Valley of Texas for a short trip with four friends to see some of the special wildlife (mainly birds) that are found here. 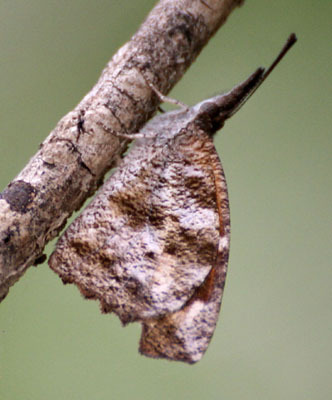 A number of Mexican species hop over the border to be found no where else inside the states (a few of these species might also be found in the area of S.E. 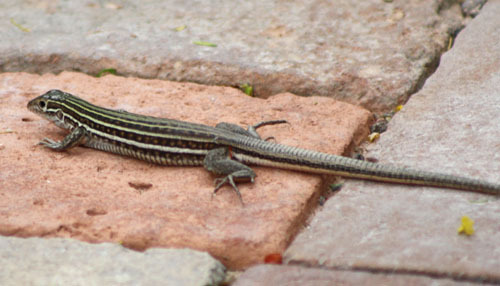 Arizona). 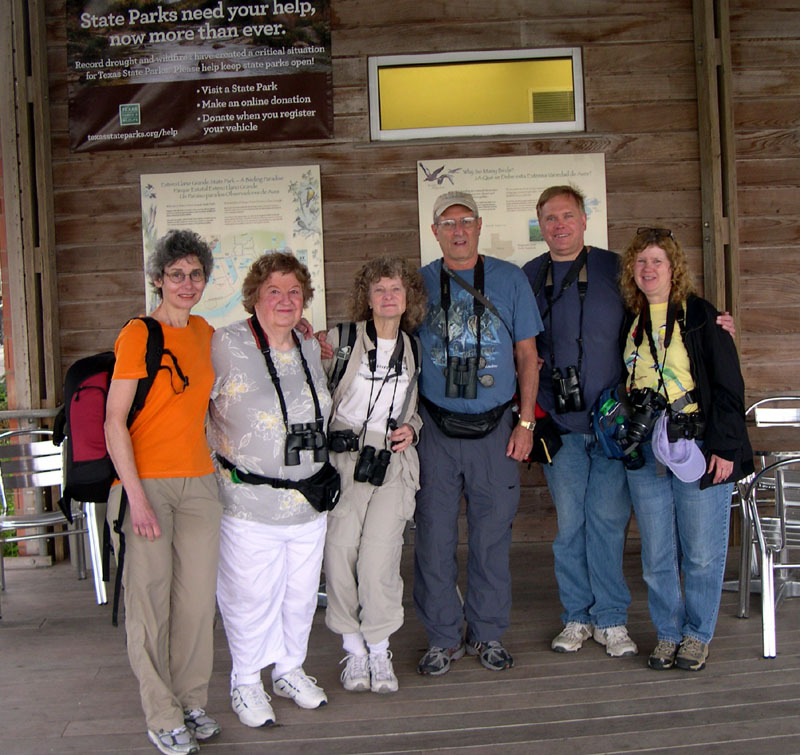 Our friends included Fran, Carol, and Judi & Saul, all board members of the Hudson River Audubon Society. We left mid morning for our 1 PM flight from LaGuardia Airport to Houston. Kelli’s sister Joan drove us. We met three of our other travelers by accident, curbside, as they were getting out of their limo. Check-in and security was a breeze. Our United flight (formerly Continental) left on time with a full plane. A few things I don’t like about United Airlines. Their overhead bins are limited in size forcing many people to check their carry-ons. We were fine with our correct size luggage as I would not want to check luggage with all of our cameras and binoculars inside. Their jet down to Houston lacked any form of entertainment, no movie or satellite radio. It made for a long boring flight. It was a bit bumpy on takeoff but we arrived ahead of schedule. We landed in terminal E, but our second flight was out of terminal A. Judi flagged down a motorized cart for all of us to pile on. We then had the most entertaining and frightening ride of our lives as the porter zoomed through terminals E, D and C, turning sharply and zigzagging within inches around inattentive travelers without ever slowing down. He would have made a NY City Taxi Cab driver proud. We then took the train the rest of the way to our gate. We had a long wait in Houston as planned. The trip down to McAllen Airport is notorious for luggage not making on to its second leg if the layover is not long enough. Our fourth traveler, Carol met us here for the short flight down. It was on a Bombardier, an actual plane with propellers. We had to check our carry-ons planeside as overhead bins were even further limited. Our deplaning was delayed because the jetway (or jet bridge) would not move into position and had to wait for an actual staircase to be moved in. We then had to climb done the narrow stairs onto the tarmac and pick up our carry-ons and head into the terminal through the doors. Our checked luggage bet us down. A porter was taking them out of an office next to the carousel. We slowly got our rental cars and drove about 30 minutes to Weslaco to the Holiday Inn Express Hotel & Suites on South International Blvd. I highly recommend this hotel, it caters to business people, its clean and well run, best of all there is a free hot breakfast in the morning. We had only one complaint, they ran out of water and diet soda in their hallway soda machines. We met at breakfast at 6:30 AM and were ready to head out by sunrise; a little after 7. 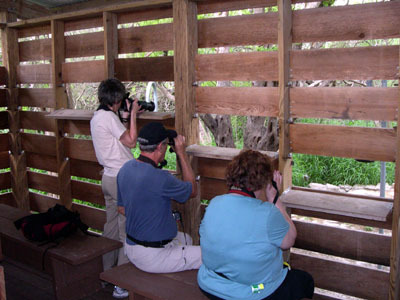 We had a short ride down South International Blvd to Estero Llano Grande State Park World Birding Center in Weslaco. 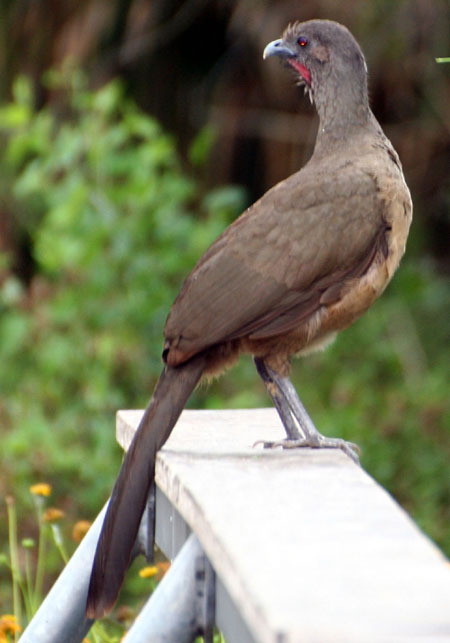 In the parking lot we were greeted by Great Kiskadees, Great-tailed Grackles, and a Couch's Kingbird. 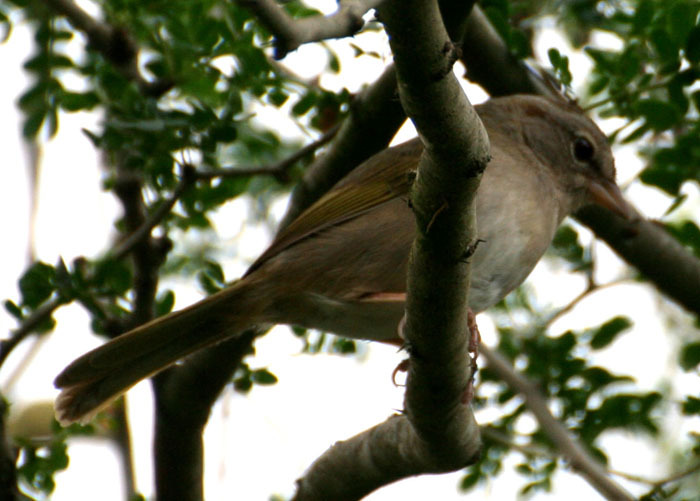 We then quickly found a couple of Plain Chachalacas in the trees. The pond in front of the visitors center was teeming with bird life. We quickly spotted our first Neotropic Cormorant followed by Black-bellied Whistling-Ducks, Least Grebes, an immature White Ibis, Black-necked Stilts and Long-billed Dowitchers. 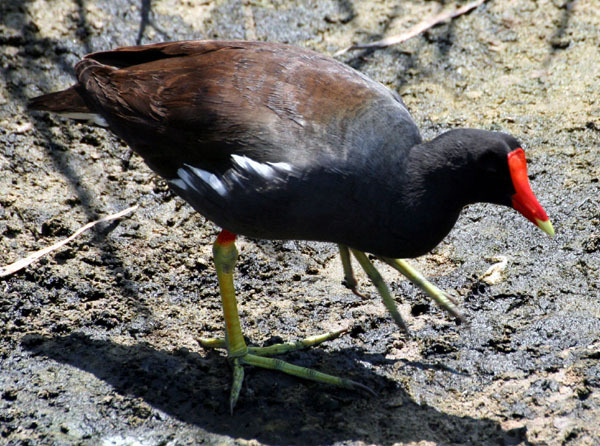 Common Gallinules and American Coots patrolled the waters. 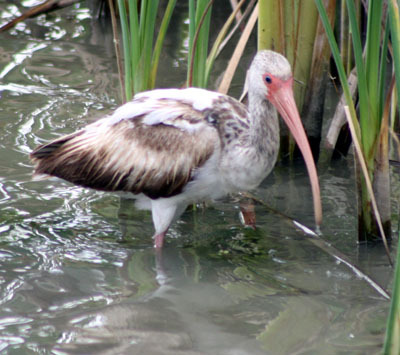 A Roseate Spoonbill flew in and settled on the far side of the pond. Fran’s scope provided us with great looks. Saul then spotted a few lingering Cinnamon Teals in amongst a number of Blue-winged Teal, I had thought we’d miss them as they usually depart their wintering grounds by now. 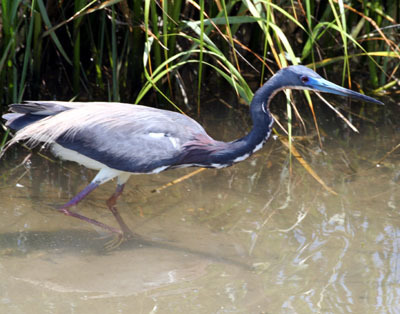 We walked the trails over to Alligator Lake where we found two alligators, Yellow-crowned Night-Herons and an Anhinga. 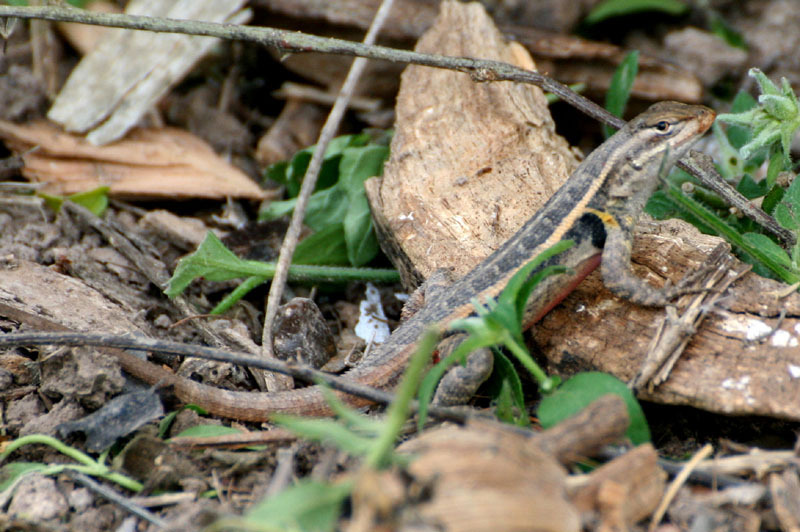 The trails had both Texas Spotted Whiptails and Rose-bellied Lizards scurrying about. A walk along the dike to view Llano Grande was productive. 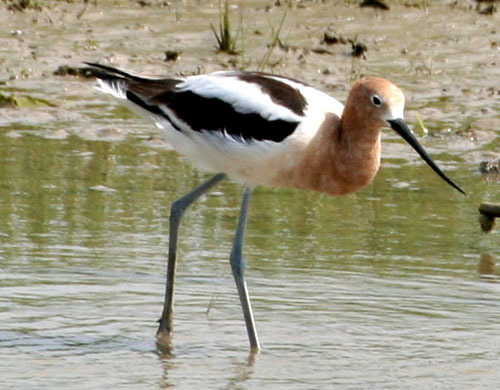 We found a group of American Avocets, a large fish with its back partially out of the water which we believe was an Alligator Gar, and two Crested Caracaras. The caracaras put on a flight display as they chased each other, finally landing on a distant electric tower. It was difficult to leave for lunch, but we pried ourselves away. 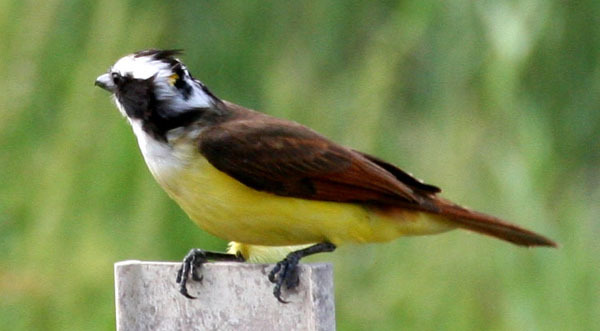 A few of us spotted a Brown-crested Flycatcher on the way out. Other birds seen here also included: Gadwall, Mottled Duck, Northern Shoveler, Green-winged Teal, Ruddy Duck, Pied-billed Grebe, Great Egret, Snowy Egret, Little Blue Heron, Green Heron, Turkey Vulture, Killdeer, Spotted Sandpiper, Solitary Sandpiper, Lesser Yellowlegs, Least Sandpiper, Rock Pigeon, Mourning Dove, Purple Martin, Barn Swallow, Carolina Wren, Marsh Wren, Northern Mockingbird, Long-billed Thrasher, European Starling, and House Sparrow. Lunch was at the Blue Onion, next door to the hotel. 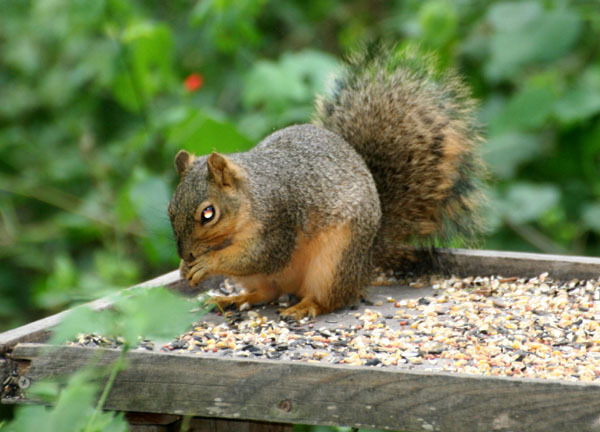 It was a good choice, the food was good but the service was a little slow. Carol’s salad took forever to come out. 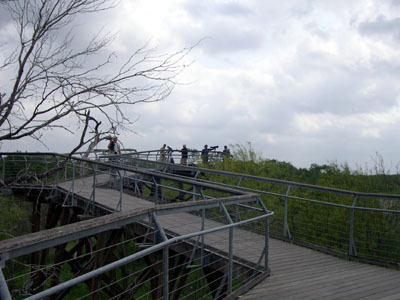 It was very hot now but we decided to head over to the Frontera Audubon Sanctuary in Weslaco. 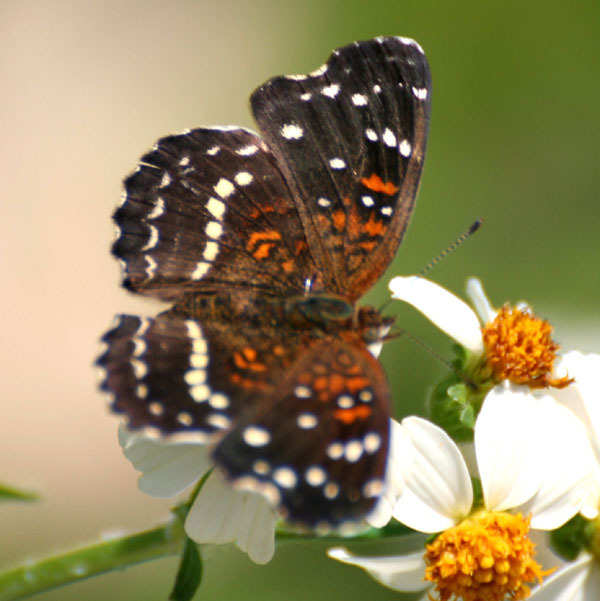 The butterfly gardens in the entrance held Brown Longtails and Texan Crescents. 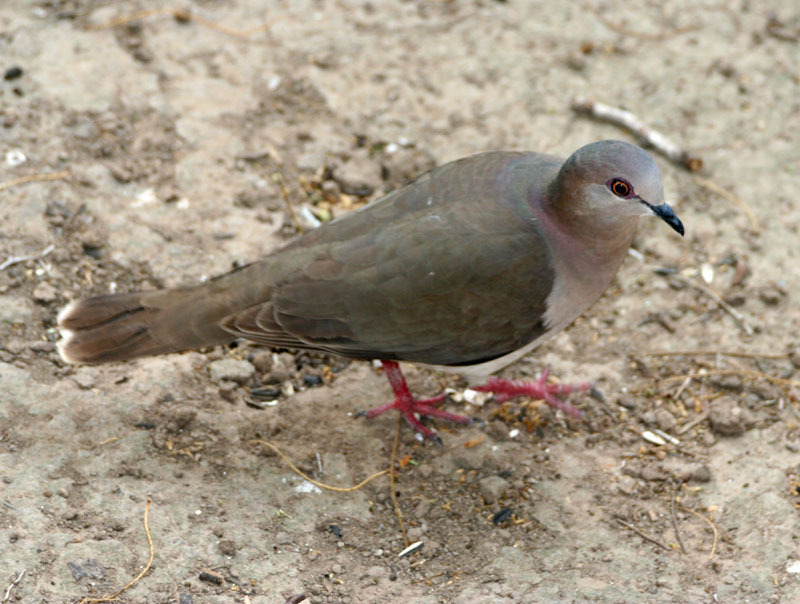 The heat made the trails nearly birdless but at the bird feeding station we had great looks at Black-crested Titmouse, Great Kiskadees, White-tipped Dove, Inca Doves and more Plain Chachalacas. I also found a fleeting Black-and-White Warbler. Dinner ended up a Ciro’s, a Mexican and Seafood Restaurant after we failed to find an Italian place that was recommended. The food and service were a big disappointment. The waiter was slow and uninterested in serving us, and got one of our orders completely wrong. We all gave the restaurant our thumbs down. We decided to head back to Estero Llano Grande State Park to have a better look at the tropical area. We were rewarded with a pair of Harris's Hawks overhead; a pair of Altamira Orioles with a long hanging nest attached to a telephone wire; and a Ladder-backed Woodpecker. We also enjoyed looks at some of the birds seen earlier. It was a great first day. We were again out the door at sunrise. We headed down to the Santa Ana National Wildlife Refuge in Alamo. 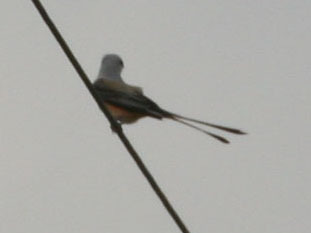 Along the way we found our first Scissor-tailed Flycatchers along the telephone lines along Military Highway - Route 281. 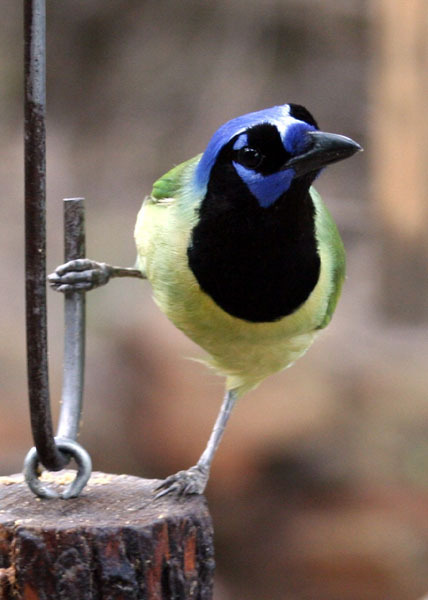 Once we arrived; some of us got our first glimpse of the colorful Green Jay as we walked to the visitor’s center. 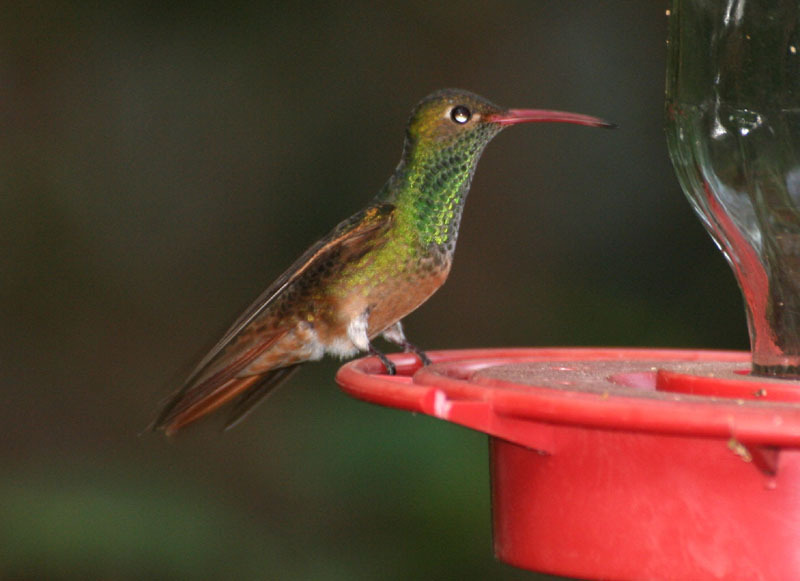 The hummingbird feeder had another Buff-bellied Hummingbird and the other feeders had mostly Red-winged Blackbirds at the time. We quickly headed for Willow Lake. 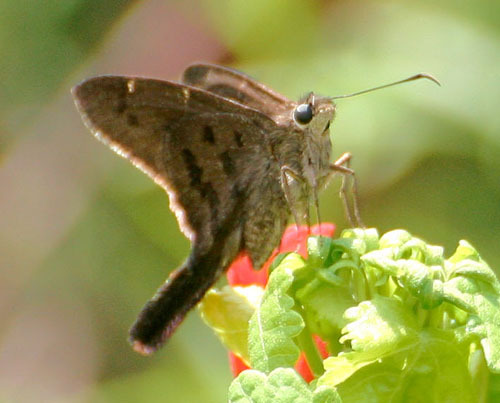 Along the way we found a singing Long-billed Thrasher and a peculiar looking butterfly, aptly named the American Snout. As we neared the large blind I heard two of our target species – a possible Tropical Parula and a Northern Beardless-Tyrannulet. 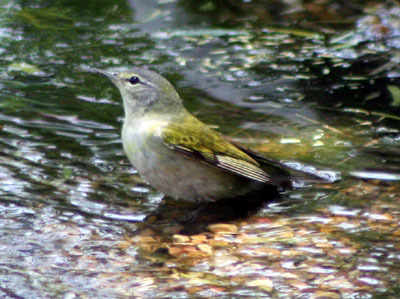 The tyrannulet; despite is long name is a drab flycatcher but with a big voice. We found him in a tree just outside the blinds and got a good look at him. 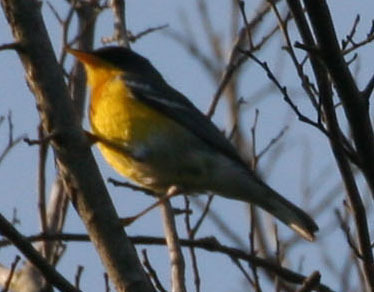 I then heard the parula - both the Northern and Tropical Parula sound alike so I was anxious to find the bird. He had moved closer to the trail and we found him, it was the rarer Tropical Parula, he lacked the white crescents around the eye and the deeper dark breast band of the Northern Parula. Both these birds were life birds for Kelli and the rest of the group. We needed to get to South Padre Island so I pulled everyone back to the visitors center. While people perused the gift shops and used the rest rooms I found a Clay-colored Thrush (Robin). Unfortunately he left and we could not find him for the rest of the group. On our way out we found more Scissor-tailed Flycatchers on the entrance road while two Forster’s Terns hunted in a field nearby. 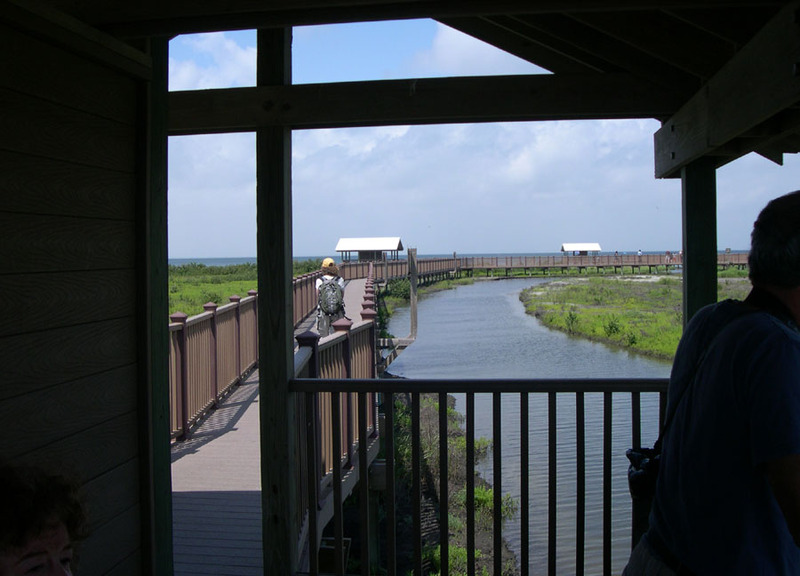 We had a long drive to the South Padre Island Birding & Nature Center. 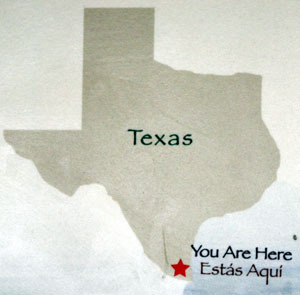 South Padre is a barrier island along the gulf and many migrants can stop over here. 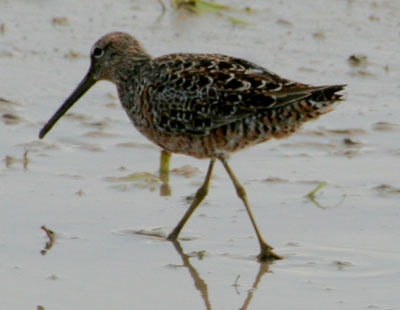 The extensive salt marsh and flats hold many birds as well. The center has an impressive board walk with shaded viewing areas long the way. It was hot, but breezy and in the shade it was very comfortable. We quickly found an Osprey and a few Black Skimmers flying about. 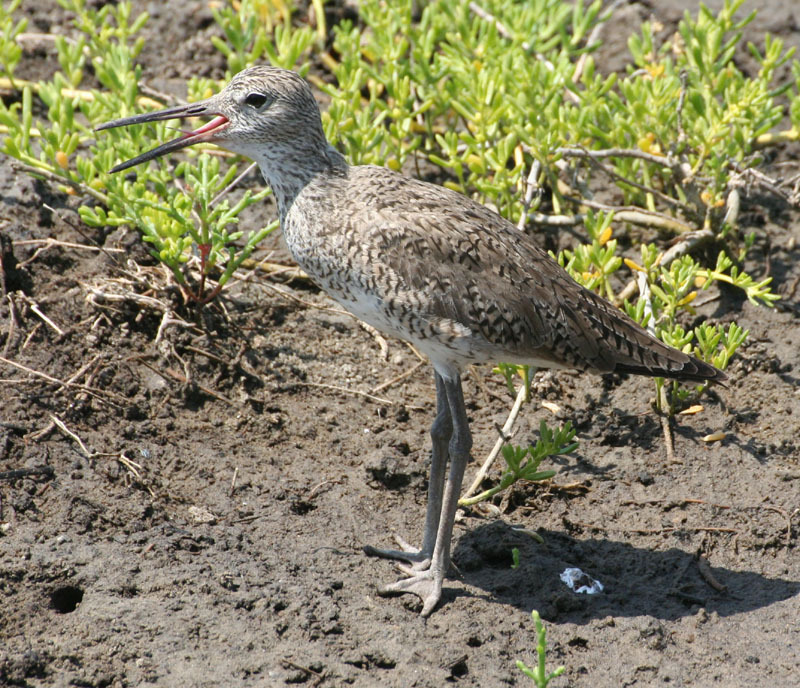 A Willet posed for his picture to be taken and a pair of Black-necked Stilts seemed to be building a nest in the mud flats. 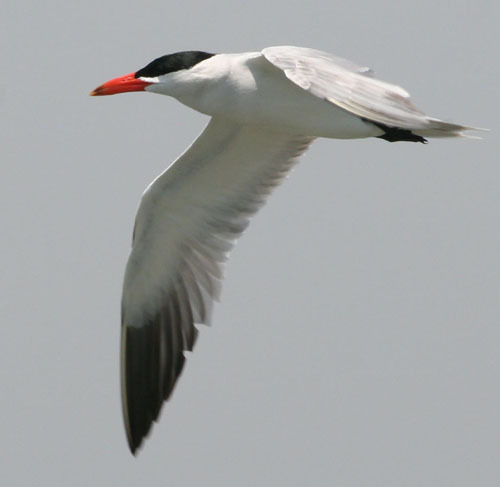 A Caspian Tern put on an aerial display; other terns were present included Least, Royal, Sandwich and Gull Billed Terns. 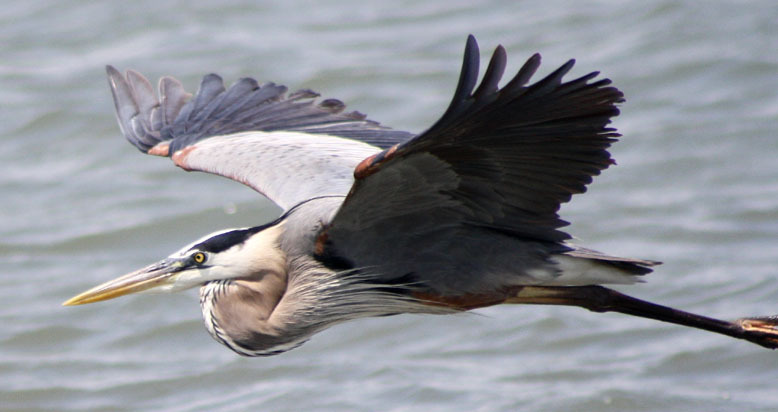 A Great Blue Heron fished in deeper water off the boardwalk and a Tricolored Heron let us take close pictures of him as well. 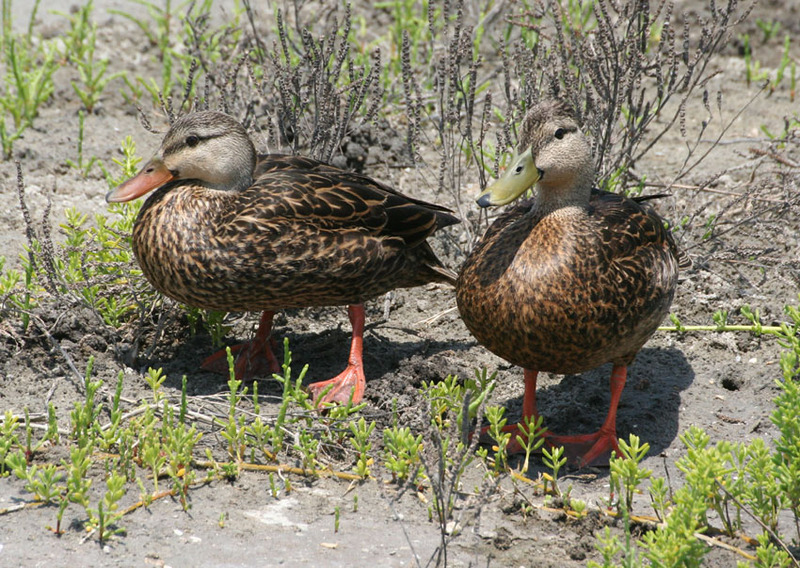 Black-bellied Ducks were abundant and a pair of Mottled Ducks posed for their portrait as well. A half dozen Marbled Godwits were on a far sandbank, but Fran’s spotting scope gave us good looks. Three Pectoral Sandpipers were found as we tried to get glimpse of one of the Soras darting between grassy areas. 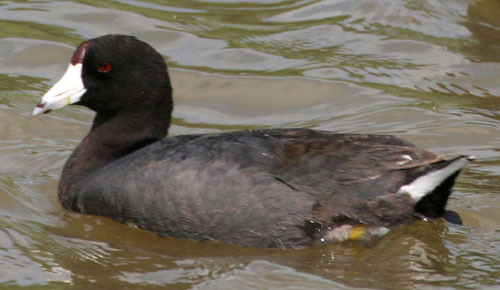 We then lucked out with a couple of accommodating Soras that stayed out in the open for everyone to see. 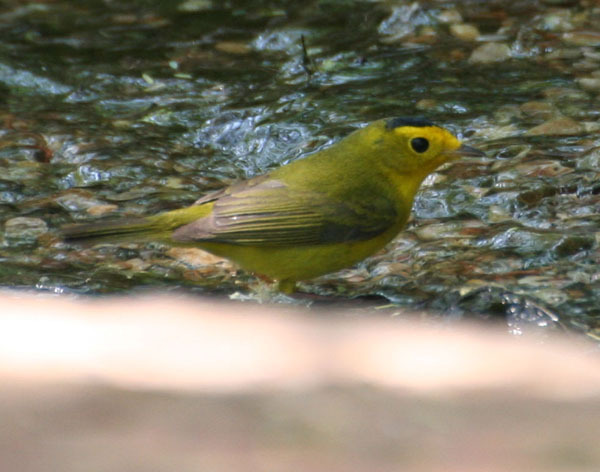 At the convention center they provide a stream of water for migrating birds and it was visited by a Tennessee and a Wilson’s Warbler. After a late lunch we split up so Kelli and I could do some shopping. On our way back I found an Eastern Meadowlark and Chihuahuan Raven along the road by keeping one eye on the road and the other on the poles and lines. We all met back again Estero Llano Grande State Park where we found two Harris’s Hawks and a Swainson’s Hawk overhead. A Ladder-backed Woodpecker was very obliging and I found another Clay-colored Sparrow but only Kelli got a glimpse before it flew off. We left a little later since breakfast at the hotel started 30 minutes later on weekends. We drove out to Bensten-Rio Grande Valley State Park in Mission. This used to be a great place to bird when it was still a trailer park. Many a first North American record was found here, but with the trailer park gone it has lost much of its former greatness. 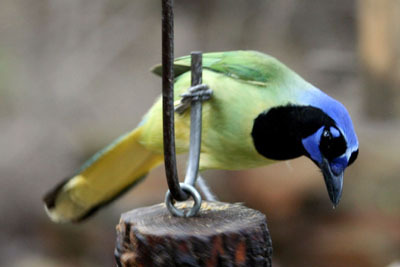 Still – it’s a great place for Green Jays and a good spring hawk watch. The workers inside the visitor’s center were uninterested in getting birders quickly into the park and it took 20 minutes for all of us to simply pay the entrance fee. 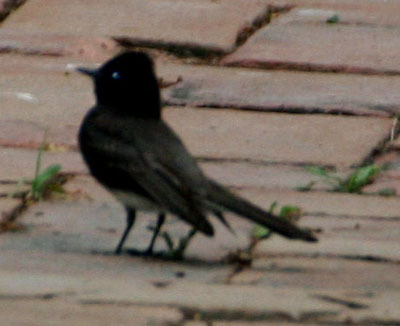 As we passed the tram (which can take you into the park and save some walking) we found their resident Black Phoebe. The tram operator said it would be leaving shortly but I knew better. 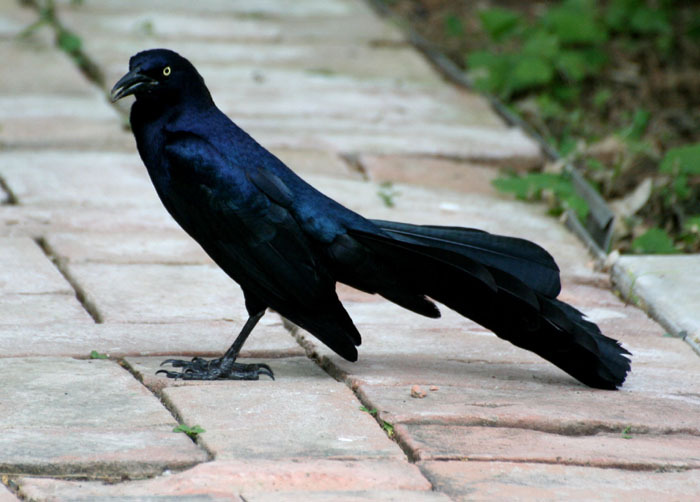 We walked in and birded to the next tram stop inside the park and found our first Bronze Cowbird. We still had to wait a while before the tram made it to this spot. We took it over to La Parida Banco Resaca (recasa = lake) in hopes of finding kingfishers. 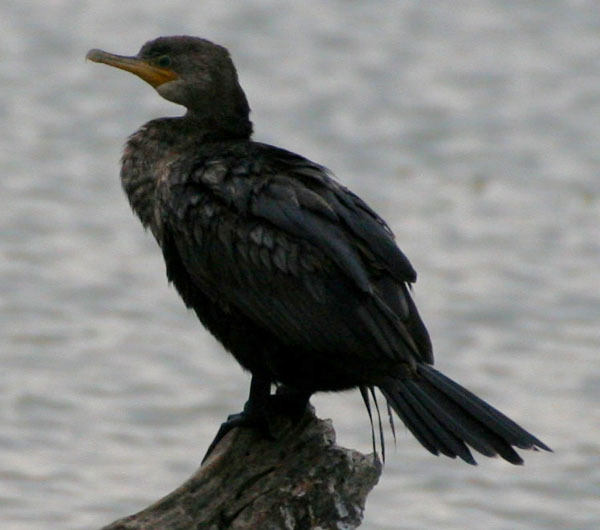 A Neotropic Cormorant along with a few Anhingas were the only things on the lake. After a restroom stop I lead the group over to the Green Jay blinds – and did it live up to its name. We immediately had great looks of Green Jays along with a variety of doves. 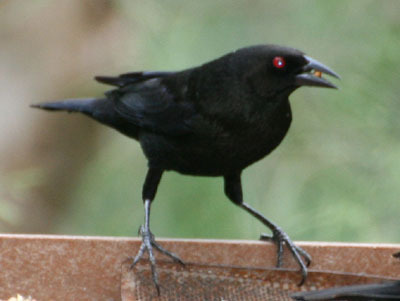 Then a Bronze Cowbird came in giving everyone a good look at this red-eyed cowbird. An Orange-crowned Warbler also made a brief appearance. The blinds at Bensten are one of the best designed. We then took the tram to the hawk watch trail. The trail leads into the woods then up a long zigzagging ramp to a platform so you are above the trees. 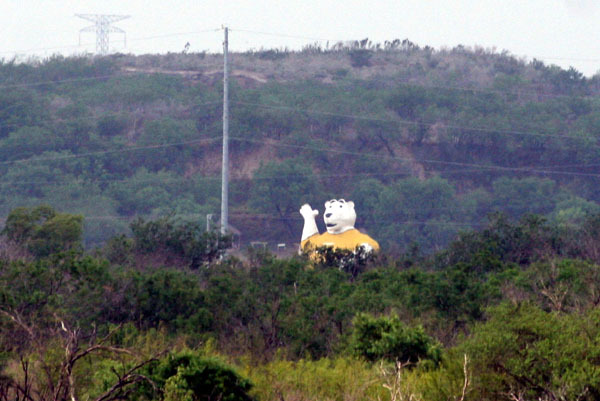 You can see Mexico from here, including a giant Polar Bear - apparently from an old water park. It was very windy with a steady 20 mph southerly wing gusting higher. A Northern Mockingbird sang form a dead tree branch next to the hawk watch platform. 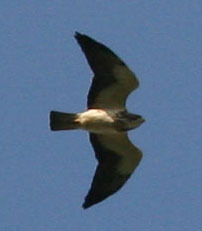 Our first hawk was a low Swainson’s Hawk. 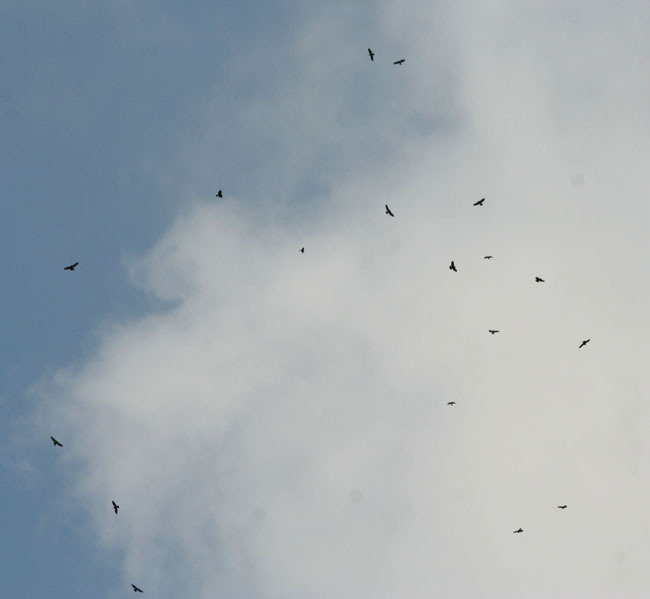 Soon we found kettles of Broad-winged hawks soaring high overhead. 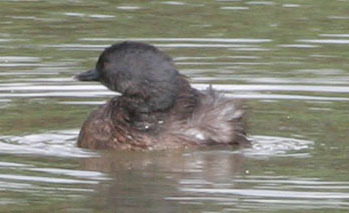 They came in bunches of 30 to 70 birds at a time. 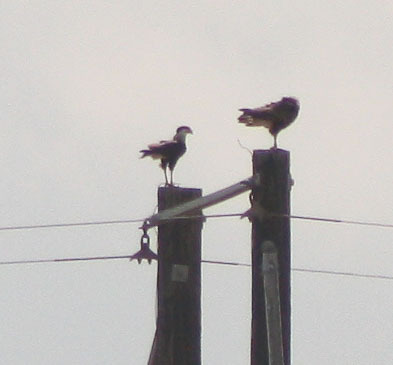 A few Turkey Vultures were also seen as well as one migrating Cooper’s Hawk. We could only take so much of the wind so we headed back down. 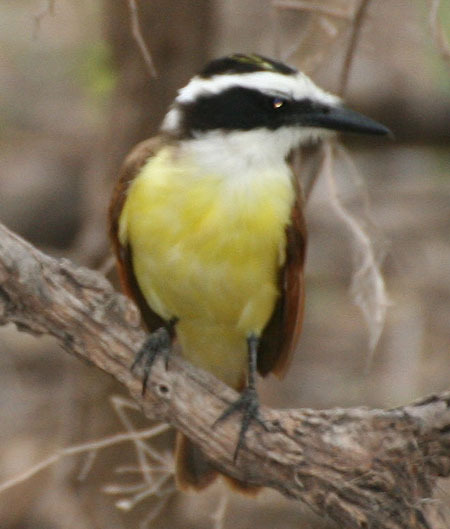 We took the tram to the old inner loop where we took a trail to the Kiskadee blind. 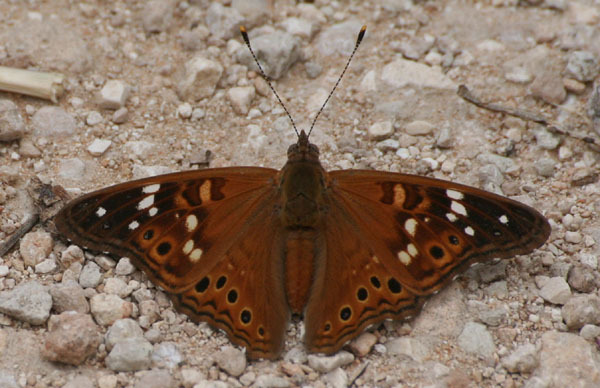 Along the road we found a few Empress Leilias (a Mexican butterfly). 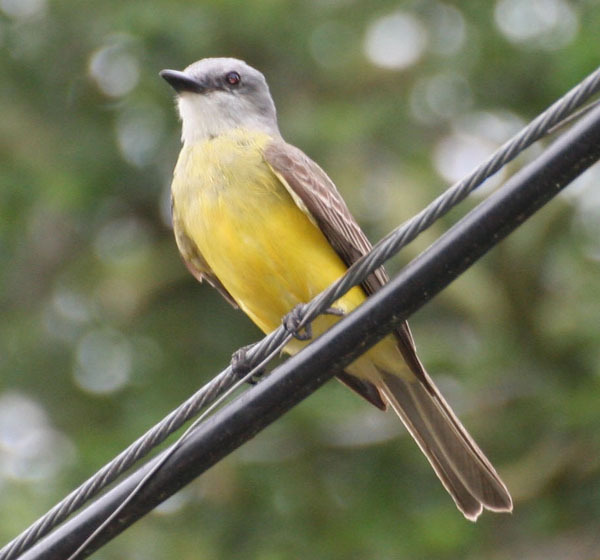 We saw Couch’s Kingbird and Great Kiskadees before we got to the blind and found more once inside the blind. Green Jays started making appearances too. We all had great looks here, but added nothing new. We made our way back to the tram stop but not before getting good looks another singing Northern Beardless-Tyrannulet. We had a long hot 45 minute wait for the tram. A Large Orange Sulphur butterfly was found here and a few Green Jays made brief appearances as well as an accommodating Ladder-backed Woodpecker. The tram finally arrived and took us back to the nature center and after a restroom break and some shopping we all had lunch at a Cracker Barrel restaurant. We then headed back to Santa Ana NWR for our last birding for the trip. Green Jays were making visits to the feeders. 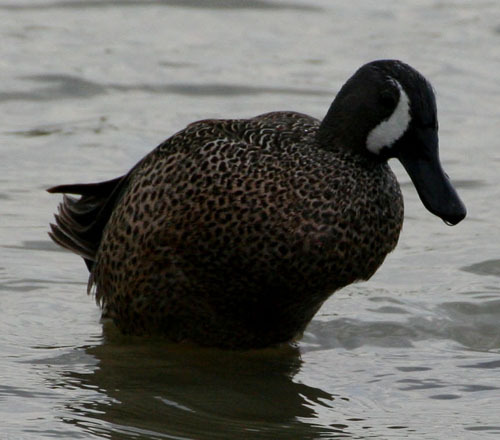 We headed out to Pintail Lake. 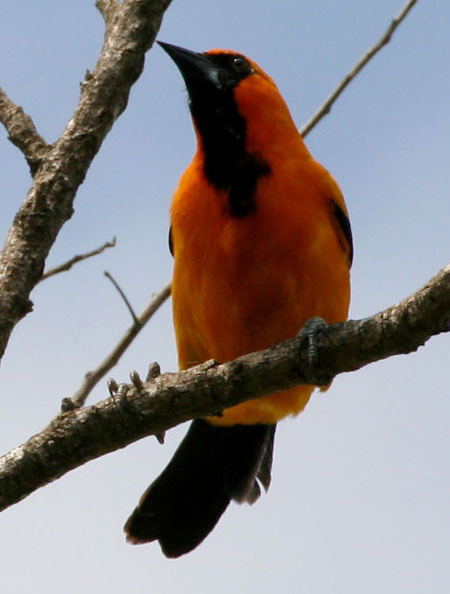 Along the trail we found another Altamira Oriole. The lake was partially dry and we had an extra walk to find some water. 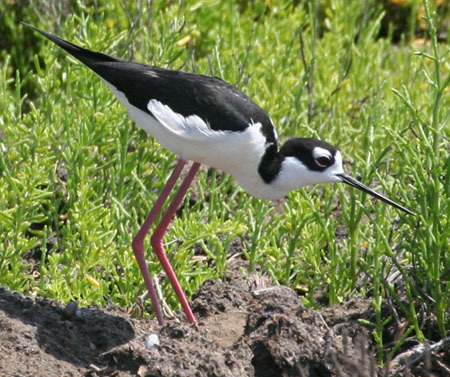 Shore birds found included three Stilt Sandpipers - not to be confused with the also present Black-necked Stilts - a few Short-billed Dowitchers and a very close American Avocet. 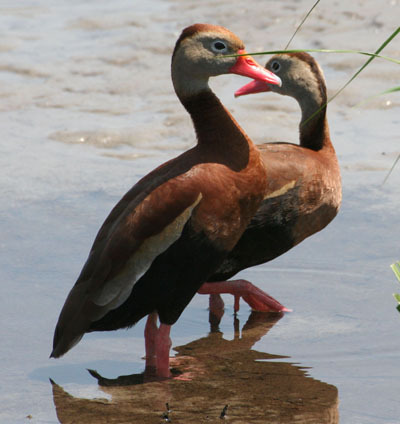 In the deeper waters we found Redhead Duck , another Cinnamon Teal, and about fifteen Fulvous Whistling Ducks. 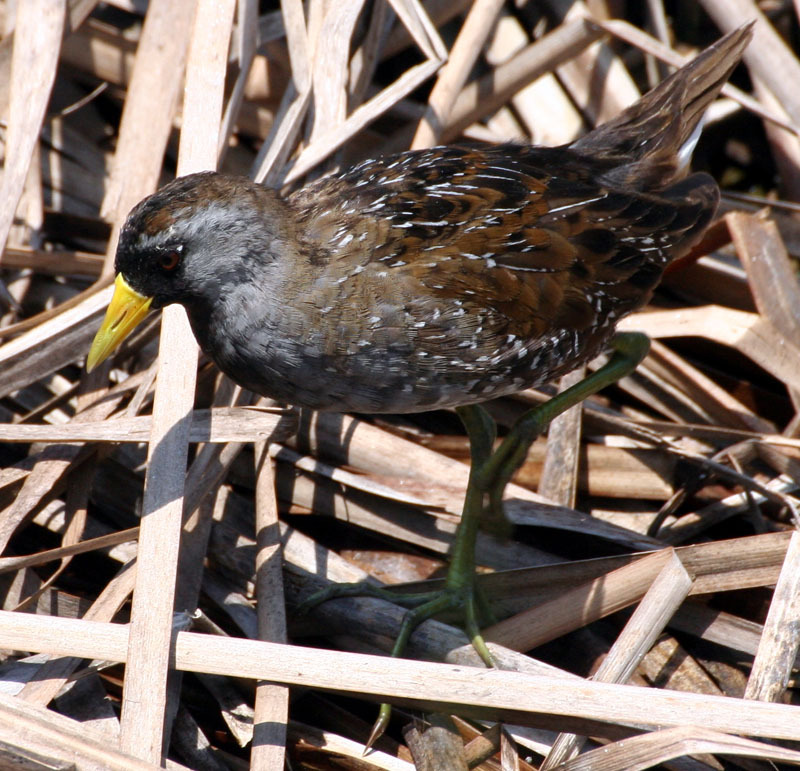 A Harris’s Hawk flew by and a Sora was found along the waters edge. 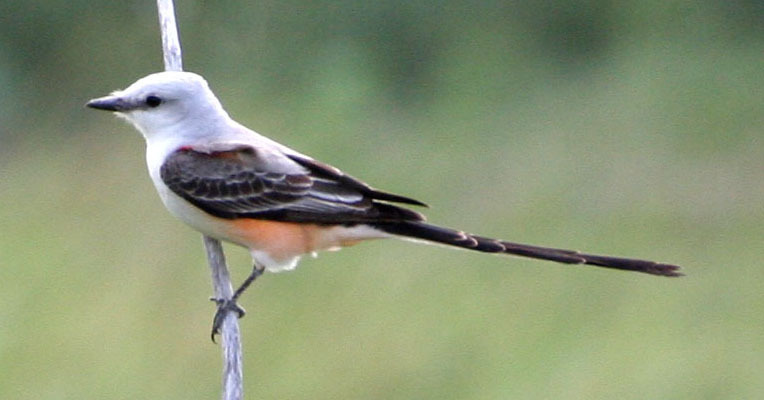 On our walk back a Scissor-tailed Flycatcher posed for some better pictures. Dinner was with everyone at an Italian Restaurant close to the hotel. Then Kelli and I said our goodbyes and headed back to the hotel to pack, We had a very early flight out the next morning.